Left: Dr. Jack Colonel of Woodward Clyde speaking at AIOC's first Public meeting on the Environmental Impact Assessment, February 4, 1996. On January 18, 1996, the Inter-Governmental Agreement between Azerbaijan and the Russian Federation was signed for the transportation of Early Oil through Russia to the port of Novorossiysk on the Black Sea. Now AIOC can proceed with key contract awards and purchases necessary to start Early Oil production in the second quarter of 1997. Negotiations with Georgia on the western pipeline route were held in Baku in late January and are continuing. Negotiations with Turkey on financing models also continue. 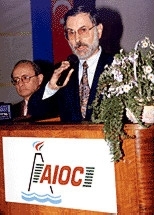 On February 2, 1996, AIOC opened a public exhibition in Baku, highlighting the environmental aspects of AIOC's project for Azeri, Chirag, and deepwater Gunashli. These fields are located in the Caspian approximately 100 kilometers east of Baku at water depths of 300-600 feet. Dr. Arif Mansurov, Chairman of the Azerbaijan State Ecology Committee, officially opened the exhibition. Other participants included SOCAR's First VP, Sayad Ibrahimov and Einar Tresselt, AIOC's VP for Health, Safety and Environment. The Environmental Exhibition is on display at the Azerbaijan Oil & Gas Engineering Society on Neftchilar Prospect through the end of April. Special educational presentations are available. On February 4, a public meeting was held in SOCAR's auditorium to discuss AIOC's Environmental Impact Assessment (EIA). Left: Neftgaz 62 used for AIOC baseline surveys offshore. Such meetings are stipulated in the Production Sharing Agreement (PSA). Scientists, reporters, oil workers and other environmentally concerned people attended. Presentations were made by Dr. Liz Rogers, AIOC's Environment Manager, Jack Colonel of Woodward Clyde, and Robert Jaques of Det norske Veritas (DnV). Woodward Clyde has been involved with conducting a comprehensive Environmental Baseline Study for AIOC. DnV is the Norwegian firm which was awarded the EIA contract. They are cooperating with specialists from Azerbaijan's Gipromorneftegaz, in work that includes the contract area offshore, pipeline routes, as well as the onshore pipeline terminal. Dr. Urkhan Alakbarov, VP, Azerbaijan's Academy of Sciences, observed that this was the first time in the history of Azerbaijan's oil industry that the public had been invited to engage in active dialogue about the environmental aspects of a development project. Left: Azerbaijani workers welding Chirag I Platform. John Hollis, AIOC's Senior VP, Technical Projects, and Jim Franklin of MacShelf (a joint venture between McDermott and SOCAR) signed a Memorandum of Understanding (MOU) on January 31, 1996, permitting the start of refurbishment of the modules recently relocated from the Chirag I platform to the SPS Fabrication Yard. Over the past few months, this joint venture has been training Azerbaijani workers in welding, safety and Western practices. On January 26, AIOC sponsored its third "AIOC / SOCAR Community Concert" at the Opera and Ballet Theater. The event was sponsored in cooperation with the State Music Academy. The elegant hall which seats 1,000 was completely filled. The evening opened with George Gershwin's Concerto for Piano and Orchestra featuring pianist, Zulfiya Sadigova. Rauf Abdullayev conducted the 70 member Symphony Orchestra of the Opera and Ballet. It was the first time Gershwin's works have been performed in Azerbaijan with a full symphony orchestra. A special highlight of the evening was the celebration of the 70th Jubilee of Professor Farida Guliyeva, who has dedicated 45 years to professional music. Sadigova was one of Guliyeva's students. Irada Shamilova and Zumrud Aliyeva also performed works that evening by Gershwin and Rachmaninoff. Thomas Wolfe's novel, "The Web," has just been translated and published into the Azeri language. The project was sponsored by AIOC and carried out by the Literature Translation Center in Baku. It is the first time that any of Wolfe's works have appeared in Azeri. AIOC's Government and Public Affairs Department is now publishing a newsletter, "Azerbaijan Weekly," so AIOC expatriates can stay informed about major news and developments in Azerbaijan. Tamam Bayatli edits the publication.